Disconnect the drive shaft (see page ds-69). Using a dial indicator, measure the backlash near the center of the axle hub. If the backlash is greater than the maximum, replace the axle hub. Using a dial indicator, measure the disc runout 10 mm (0.39 In.) Inside the outer edge of the disc. If the runout exceeds the maximum, change the installation positions of the rear disc and axle hub so that the runout will be as low as possible. 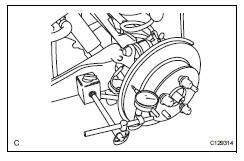 If the runout exceeds the maximum even when the installation positions are changed, shave the rear disc. 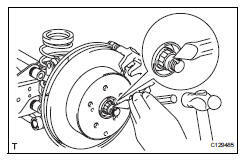 If the rear disc needs to be shaved to less than the minimum, replace the rear disc. 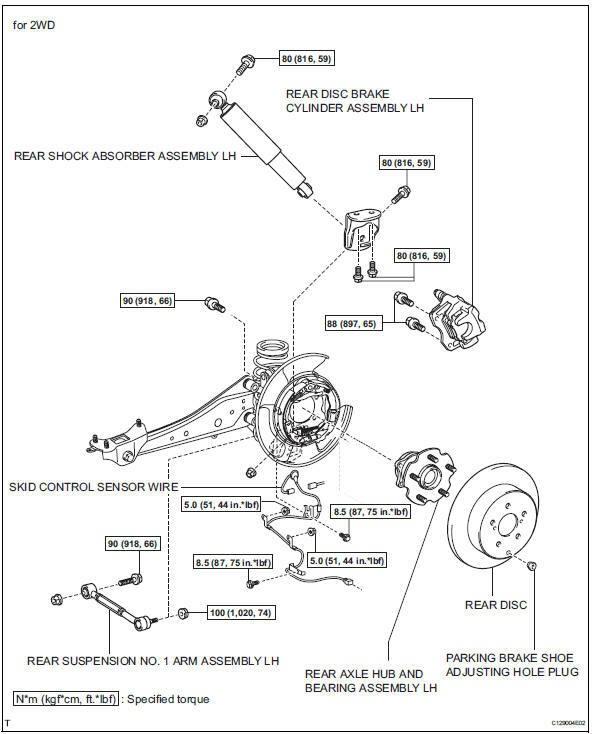 If the rear disc is replaced, perform the runout inspection again. If the runout still exceeds the maximum, replace the hub and bearing with a new one. Using sst and hammer, unstake the staked part of the nut. Loosen the staked part of the nut completely, otherwise the screw of the drive shaft may be damaged. 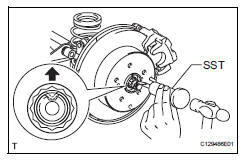 While applying the brake, remove the lock axle hub nut. Remove the 2 bolts and disconnect the shock absorber with bracket from the axle carrier. 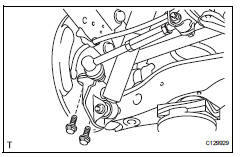 Remove the 4 bolts, and axle hub and the bearing from the axle carrier. Do not place the hub and bearing's magnet rotor side so that it is facing downward, and do not allow the magnet rotor side to become damaged or contact foreign matter. Put matchmarks on the drive shaft and the axle hub and bearing. 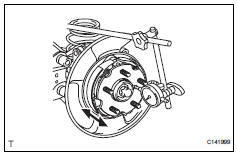 Remove the 4 bolts, and the axle hub and bearing from the axle carrier. Install the axle hub and bearing to the axle carrier with the 4 bolts. Align the shaft splines and drive in the drive shaft to the axle hub and bearing. 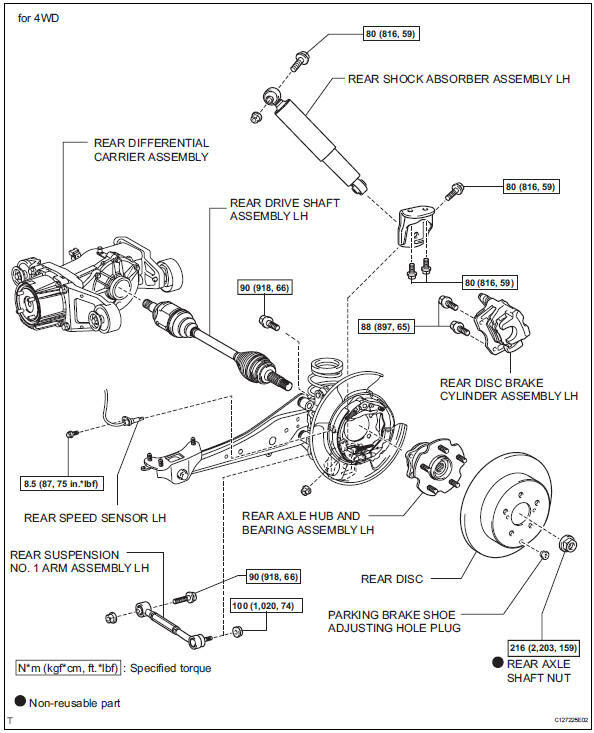 Install the axle hub and bearing assembly to the axle carrier with the 4 bolts. Install the shock absorber to the axle carrier with bracket with the 2 bolts. 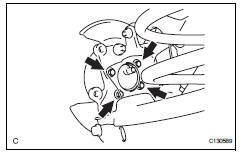 Install a new hub nut. Using a chisel and hammer, stake the hub nut. Check the speed sensor signal (see page bc-44).